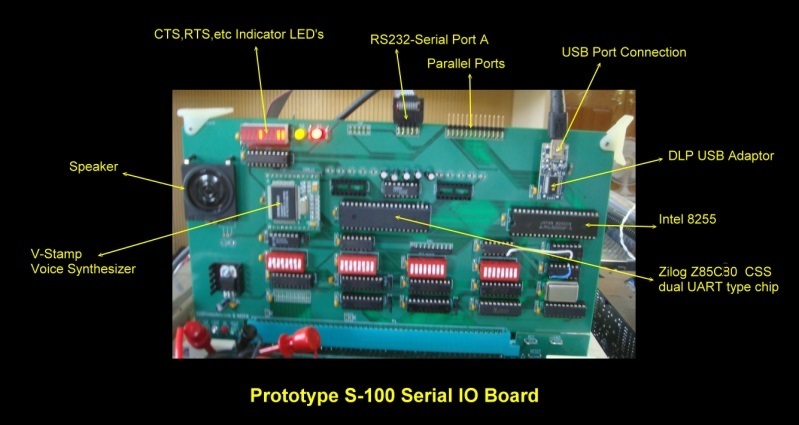 Many S-100 systems have some kind of Serial IO board in their system. 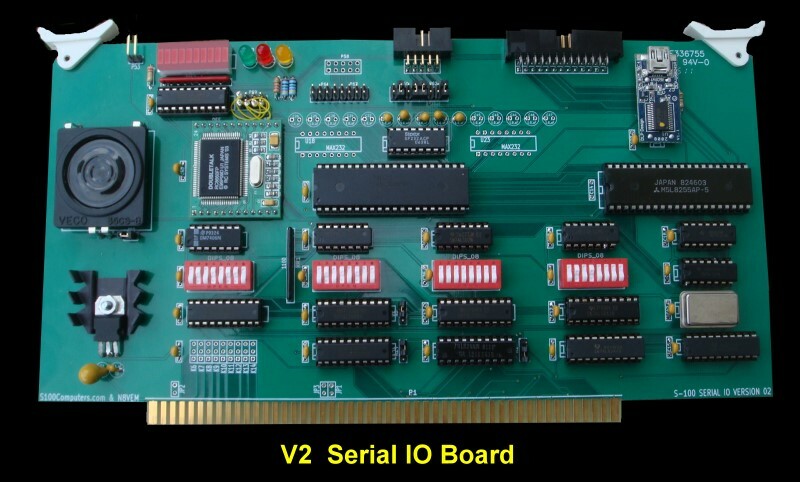 Serial IO is primarily used for communication with a CRT terminal, though some printers also used serial IO. 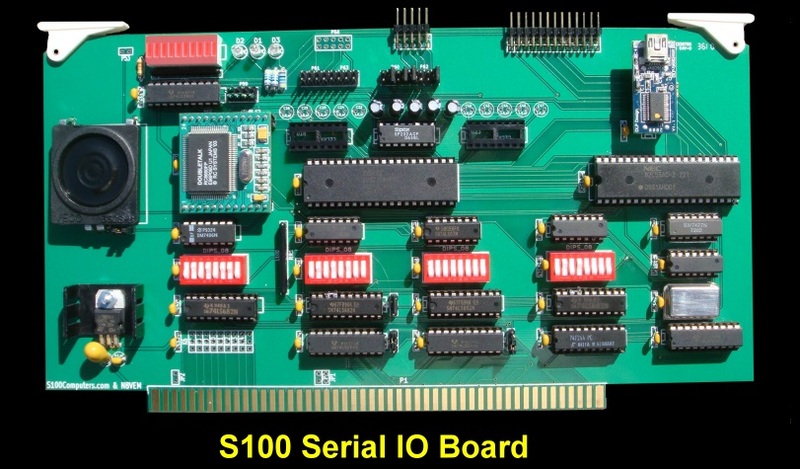 With the advent of multi-user S-100 systems, serial IO was almost always used to connect the multiple terminals/users to the system. This was before the days of networking and the Internet! General Instruments' AY-5-1013A. This was widely copied by SMC, TI, Western Digital and others later. The chip however required a separate Baud rate generator (BRG, typically a 4702). Next came the Intel 8251A type chips. These also could transmit in a "synchronous" data format where the transmitter and receiver shared a common clock signal. This was really never used in S-100 systems but the chip itself was commonly used. Again a separate Baud rate chip (4702) was required. Signetics and National Semiconductor came up with the equivalent 2651 and 8250 chips. These chips had the advantage of having the Baud rate generator onboard. It just requires a 5.068 crystal (2651) or the 2MHz S-100 bus signal (8250). Motorola had its own 6800 type "ACIA" equivalent chip the MC6850. It is perhaps the easiest to configure but you need to "bend" the Intel style S-100 bus signals to use it. The TDL SMB was the most common case of its use on the S100 bus. Not to be out done Zilog had their equivalent chip which they called the DART. It's big advantage was that it had two serial channels on one chip. It worked best is a Z80 hardware environment in an interrupt driven mode. 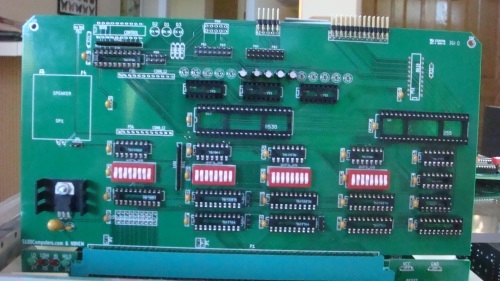 A number of S-100 Board manufactures started to add multiple chips to one board. 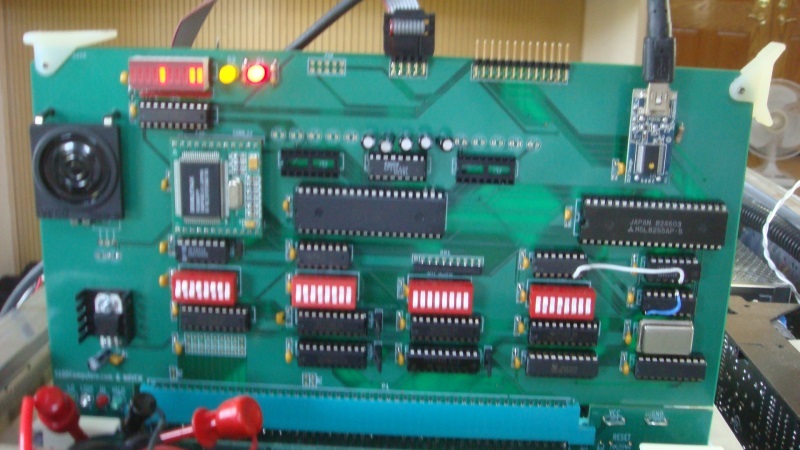 A good example of this was the Cromemco TUART board which had two dual channel TMS 5501 UARTs on board. One of the frustrating things about many of the earlier UART chips was the fact that internally they used a block if IO addresses for their many internal configuration registers. A few of these chips on one board and bang, there goes a 20H address black. In a multi-card S-100 system finding a block of addresses that does not overlap with other cards can be a problem. 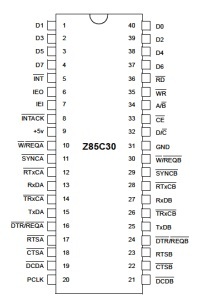 Enter the Zilog Z85C30 or SCC (Serial Communications Channel) chip as Zilog calls it. This was Zilog's second generation UART type chip. Obviously it had the advantage testing of all previous chips but it evolved into an extremely powerful UART chip. It has the capability of doing almost any format of serial communications you could come up with. Some are quite exotic. It's a dual channel chip with its own internal BAUD rate generator, but best of all its easy to interface in terms of hardware. Being a second generation chip it also has a large FIFO buffer to prevent data overruns. As icing on the cake each channel requires only two IO ports to address its many internal registers. The first port (address line = 0), address register 0 which is then loaded with the required register to be read or written to on the NEXT register read or write. The second port (address line = 1) contains the I/O data. This simple arrangement makes interfacing the chip a joy. Contrast this with a single channel 8250 which needs 3 address lines. The only catch is you have to be very careful is initializing all the chips 15 internal configuration registers. This, as we will see below it typically done by sending a block or bytes sequentially to each register in turn from a lookup table upon system startup. I decide to utilize this chip for a serial S100 I/O board. My main use of a serial port is to download and upload data and programs from my PC. I will discuss this in detail below. 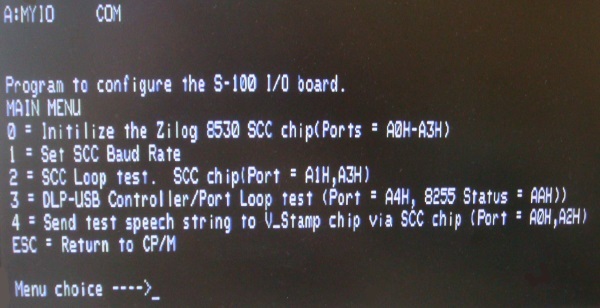 One of the nice features of the Zilog SCC is that it can be configured to very high BAUD rates. Depending on the clock up to 76,800 BAUD. I typically use mine at 38,400 Baud. This makes large program transfers a rapid process. I actually only needed one serial channel (A). This clearly left space on the board to do something with the second serial channel. 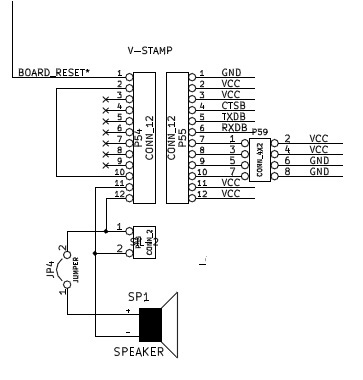 While I have brought the pins for this channel (B) to the top of the board for a second serial channel, I have as an option the ability to inserted the V-Stamp (see below) voice synthesizer chip which can utilize the second SCC channel for speech generation. So the board can have the computer "speak" into a small speaker also on the board (or to an external one). There was extra room on board! Since this was a serial type board I decide to also add a USB port to the board. 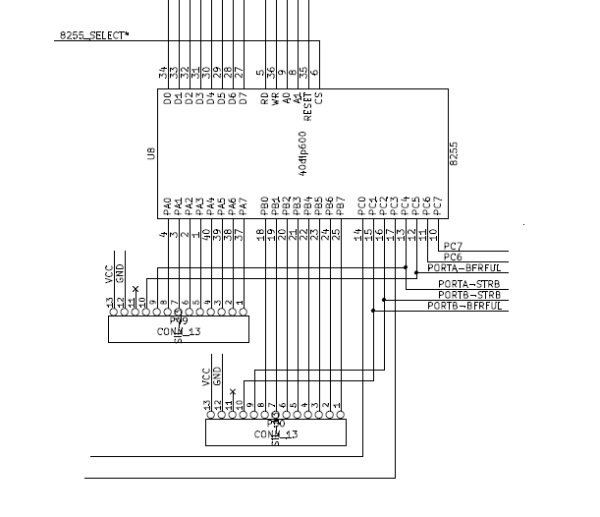 This (see below) appears to the CPU as a simple parallel port with two status bits. It is supplied in a wonderful 18 pin DIP IC type board by DLP Design Inc. It takes away completely all the complex overhead involved in USB communication. Communication over this line is completely paced by the capabilities of the S-100 CPU. My file downloads from my PC behave as if they are running at 100K+ baud! I also threw in a Intel 8255 parallel port chip giving the board two extra parallel ports. Each of the three above board functions have their own independent I/O configuration switches that can be set anywhere in the systems 256 byte 8 bit I/O adders space. Please excuse some of the wire connections. They will be corrected on the final board. Here is a diagram of the boards main components. As I said above interfacing this chip to the S-100 bus is straightforward. Two address lines are used for the two communication channels (A & B) each with it's own control and data port. PLCK can be any clock fast enough to run the chip. I use the system S-100 main clock (but have a jumper for the bus 2MHz clock for cases where in the future the bus is at really high speeds). There is no relationship between this clock and the BAUD rate/serial data transmission clock (pins 28 & 12). In order to understand how to hook this chip up to your PC using a RS-232 cable connection you must fully understand the RS-232 signal protocols. Please start here if you need more help understand the signs hookup requirements. In order to interface to the outside RS-232 world the zero or +5 volt Low/High levels of the chip must be converted to the -12V & +12V levels required for RS-232 transmission. In the 70's the two chips to do this voltage level conversion were 1488' and 1489's. These worked fine except you needed extra + and - 12 volt regulators. Today we use the +5 volt (only) MAX232 chips that internally generate the required voltages. So the serial data I/O from the SCC pins goes through the MAX 232 chips to convert the signals to RS-232 levels. (BTW one word of caution, be careful with your logic probe if you are checking this circuit -- the MAX output voltages are not TTL levels). The board has numerous jumpers to hook-up the ports to an incoming RS-232 set of signals. Getting the different signals right can be a frustrating experience -- particularly since you cannot use a TTL logic probe. (You can of course use a probe on the SCC pins themselves). There are two types of RS-232 Sockets. The older 25 pin sockets and the newer smaller 9 pin sockets. Unfortunately the pin designations are different for each type. The Clear to Send and Request to Send lines are required in particular on the S-100 side of the connection to prevent data getting lost while the CPU is busy. If you running a system at less than 1200 Baud even they are not required. The software (see below) I use however assumes they are connected. The board has the CTS, RTS, DCD and DTR signals (for Serial Port A) indicated with an LED bar indicator for easy debugging. On the S-100 side the RTS LED should flicker as data is coming across. In the late 70's primitive Voice Synthesizer chips started to become available. 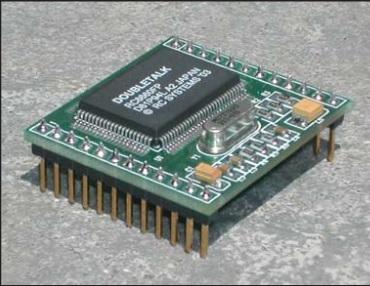 A popular S-100 board was the Computalker CT-1 board. Things have come a long way since them. Not only in the size of the chips but the quality of the speech. Today very realistic speech can be generate with a single chip IC. One particular system that I like is the V-Stamp system by RC Systems. It is based on their RC8660 chip set. See here for a complete description. The 24 pin package behaves as an idiot proof black box. You send simple ASCII text strings to the chip over a serial line (5 Volt, TTL level signals). We do this from the B channel of the above SCC. Once the chip receives an ASCII 0DH (CR), it speaks out the string with amazing intelligence. Numbers, for example, are pronounced in full (32,800 Baud is spoken as thirty two thousand eight hundred Baud). The chip even has circuitry to figure out the communication Baud rate automatically on reset. D3 A2 ;This assumes the Zilog SCC B port is being used to communicate with the chip. This sends "3" followed by a CR to the chip. It says the number "3". Please note this assumes the Zilog SCC chip has already being initialized. I do this in my "Master.z80" monitor. If not please see the SCC initialization code further down this page. While the chip and board can be connected to an external speaker/amplifier I have added a neat little speaker available from Jameco (#2095242) that delivers reasonable sound directly on the board. Once you start adding voice feedback to your programs you find yourself always doing so. You can send information in voice form that will not upset the current CRT display. Quite useful. The V-Stamp chip can be obtained here from RC Systems. They have a 3.3V and 5V version. I use the 5V version (2 min speech storage capacity, #RC860F-1C). Unfortunately it is not cheap ($75), but it's an amazing device. One other point, the pins on the V-Stamp "chip" are quite thick. I used a 28 pin DIP socket cut in half to seat the chip. Be sure beforehand the socket will accommodate the pins. Some Auget sockets will not. Please note: There is only one full equipped serial port IF you use the speech chip. That is because the interface to the speech chip is serial. Not RS232 BTW, just 5V levels. That is why with one serial port and speech you need only one MAX232. However that RS232 connection has only RS232 signals for Tx, Rx, CTS, & RTS. This does 90% of applications. If you need the other RS232 control signals you need extra MAX232’s. For two serial ports you need all 3 MAX’s. BTW, the Zilog CCS is perhaps the most elaborate serial chip of that era. It is capable of very elaborate protocols, way overkill for most applications. Like the above V-Stamp chip this USB adaptor also presents an idiot proof black box interface to a USB port connection. Communication at a fundamental level over a USB cable is extremely complex both in terms of software and hardware. Whole books could and probably have been written on the process. There was a good series of articles in a recent (2010) Nuts & Volts Magazine if you feel so inclined. To facilitate these connections a number of companies have made drop in chips that look on the computer side of things as a simple serial or parallel port. The chip transparently handles the very complex handshaking of the USB communication process -- in this case to a receiving USB port and Windows driver on my PC. The unit I decide to use was the parallel port version of the DLP Designs USP adaptor (DLP-USB245R). I obtained it from Mouser, but I'm sure its available elsewhere. It costs about $24. For a complete description of the chip see here (The spec sheet calls it a DLP-USB1232H. The DLP-USB245R behaves the same). The interaction with the chip is very easy. It has an 8 bit parallel input/output port which can be tri-stated. When pin 12 (WR) goes from low to high the DLP chip reads in the 8 bits of data and sends it out on the USB cable. When pin 11 (RD*) goes low, each 8 bit of data in a FIFO buffer that arrived over the USB cable is put on the 8 bit data bus (one byte per pulse). There are two status pins, TXE (pin 14), when HIGH do not write to the chip (is it's busy). RXF (pin15), when LOW at least one byte of data is available. I/O with this chip could not be simpler! I have the software and hardware going is a few hours. Like the V-Stamp chip above, the pins on the USB1232H "chip" are quite thick. I used a 18 pin DIP socket cut in half to seat the chip. Be sure beforehand the socket will accommodate the pins. Some Auget sockets will not. Also the pins are too long, causing the chip to be too high/close to the next S-100 board on the bus. Trim them to half their length. The program USBGET.ASM assumes the presence of the DLP-USB Controller on the S100Computes Serial IO Board. The USB "chip" takes care of all the USB signals. However it does utilize two bits of port C of the 8255 for status. On the PC/windows end, the first time you connect up the USB cable, windows should download/install the DLP driver. If not go to their web site www.dlpdesign.com and download/install it yourself from here. Under the windows "Device Manager", the hardware should be listed under Universal Serial Bus controllers as "USB Serial Converter". Note you may have more than one of these in your system. On the PC side, if you use a Telnet program the connection will typically appear as a port COMx (usually COM3 or higher). The S-100 computer must be on for it to appear on the PC as an option. UART configuration options are usually not critical (in fact I think not used). To be on the safe side I configure my port to 38,400 Baud, 8 bits, No parity, 1 stop bit, hardware flow control. The corresponding USBPUT.ASM sends a file from your S100 system to a PC. All these files are included below. You can also run the test program MYIO.ASM (see below). Use menu option 3. With your Telnet program configured to the USB port on your PC, any character you send should appear on your S100 Console. I recommend the Telnet Program Absolute Telnet. Under "Options", select "Properties", then select "Connection". Your DLP windows driver should appear as a COMx port. If you pull out the USB cord that COM port should disappear from the "port" dropdown menu. It will reappear if you reconnect. This is a very well known chip and will not be described again here. 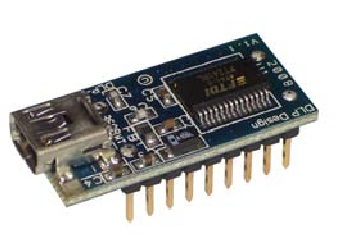 See for example its description and use in the IDE adaptor board. The reason the chip is on the board at all is to obtain two input bits for status bits of the above DLP USB chip (PC7 & PC6). I use bits 6 and 7 of the 8255 port C for this purpose. Ports A & B are brought to the top of the board as general I/O parallel ports. The remaining bits of port C are used as status/strobe/LED indicator bits for ports A & B. Programs to Upload and Download files from a PC with this board can be obtained here. ; DB 7EH ;10, Low byte 1200 Baud for debugging. ; DB 0FEH ;10, Low byte 300 Baud for debugging. DB 01H ;14, Using a 4.9152 MHz BRG Clock. Remember the BAUD rate values are dependent on the BRG clock rate. If a different crystal is used, different values need to be inserted. To actually use the chip for simple communications you only look at status bits in Register 0 (By default the CTRL port). However if you need to control (raise/lower) the RTS line you need to access the Write Register 5. See my PGGET.ASM for example (see bottom of this page). This board I would classify as medium in terms of building it and getting it to work. The complications are not so much the board itself but the task of getting the RS232 communications link with another computer wired right. The LED bar on the top left of the board is very useful here. First solder in all IC sockets, switches, capacitors, resistors and the 1.5A Voltage regulator. Do not add the sockets for the V-Stamp or USB adaptor yet. In this example (and the software described above) we will assign the following board ports with via DIP switches SW1 - SW4. SW2/U3 (see schematic) is utilized only for 16 bit IO Port addressing. Many Z80 boards set the upper 8 bits for port I/O addressing to zero so SW2 will have all eight switches set to ground. It can however be utilized nicely in 8086/16 bit systems. You can of course bypass this option completely by jumpering K5 to 2-3. Then only the lower 8 bits are utilized for port addressing. Note if you use the 16 Bit port addressing all ports are affected. For most CPM applications the high order 8 bits will be 0. Not so for MS-DOS. Inputting from port A0 should pulse pin 19 of U20 low. Repeat for ports A1H, A2H and A3H. It should not pulse low for port A4H or higher. Next try jumpering K5 to position 1-2 (16 bit port addressing) -- see above. Next add U24 add LED2. Be sure you insert the LED correctly. The longer lead goes into the square solder pad. If in doubt don't yet solder in place just juggle it about in a repeat of the above test. The LED should light up with the correct port addressing. Pin 6 of U3 should pulse low. Next install U7 and U9. These are the critical I/O buffers to the board. Check that inserting the board into your system does not lock-up your system. With your monitor input from port A0H. You should get 0FFH. Add jumper K24 2-3 and carefully add U17 the Zilog SCC chip and the 4.9152 MHz Oscillator. (Note: This is labeled in error on the silkscreen of the board, it is marked in error as "4.92162"). Actually you can use any similar speed oscillator, you must adjust the Baud rate value in table above. Next add K1, jumper it 1-2 or 2-3. Add all remaining IC's except the 8255, V-Stamp, USB Adaptor, and the MAX chips (U18,U16 & U23). We will now run a critical SCC loopback test where we will send serial data out on pin 15 of U17 and receive it back on pin 13. The CTS (pin 18) and RTS (pin 17) also need to be connected. We do this before adding the RS232 voltage conversion circuitry of the MAX chips to simplify this and where we don't have to worry about jumpers etc., (see below). Levels at this point are TTL so you can use a logic probe. Now as I said above, for this to work the SCC has to be initialized carefully and correctly. Download the MYIO program and run it under CPM. Go to the Loopback test -- option 2. In the loopback test whatever character you type on the keyboard should appear on the screen. This indicates the SCC is working correctly -- a major point in the boards assembly! P60 3-4, 7-8. P62 1-2, 7-8. Then at the top connector P57 3-2 and 7-8. Do the above loopback test again. This time you are looping around the RS232 circuit. Do not use a TTL logic probe on these signals! Only if you get the above to work should you try adding true external device such as a terminal or modem. There may be more connections required -- depending on the device. If for example a DTR signal is required you need to add U23 and jumpers. Once you have this serial port working you can use it to upload and download code/programs from a PC very quickly. The Zilog CSS is easily capable of working at 32K Baud and above. See here for more information on this topic. Next let us setup the Speech synthesis circuit. 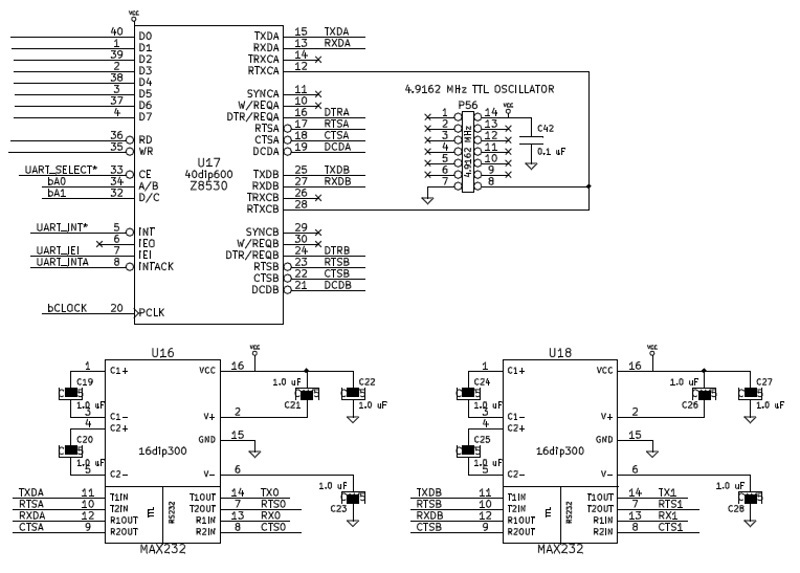 This circuit utilizes the B port of the Zilog SCC chip. 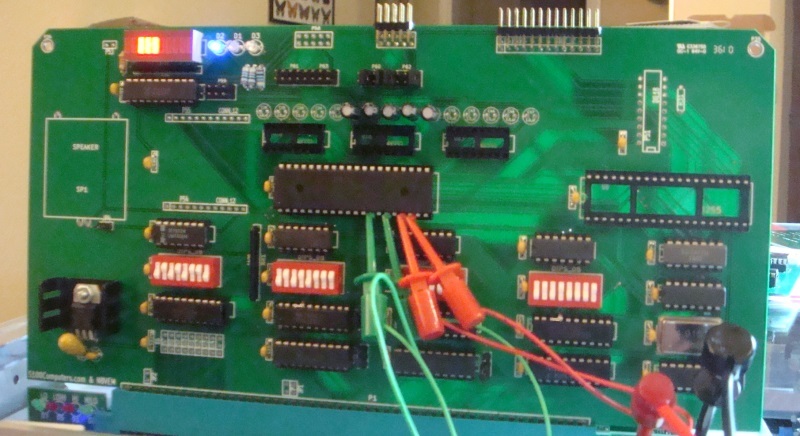 If you don't need speech synthesis you can have two independent RS232 ports on the board. Just add the appropriate connections and jumpers as described for port A. Unfortunately the V-Stamp speech synthesis mini board is expensive (~$80) so you need to handle it with care. Rather than solder it directly to the S-100 board I added two rows of 12 pin connections. I used an 40 IC socket (the skeleton variety with a large gap in the middle) and cut out two rows of 12 pins. You can then plug the V-Stamp chip into this makeshift socket and yet remove it later if need be. You also need to insert the speaker. The Jameco speaker I used had somewhat long pins which I trimmed so the speaker was low profile on the board. P59 pin 2 to 1, 3, 5 and 7. Do not forget to add jumper JP4. Again you can test the chip and its ability to speak with the program MYIO (Option 4). The switch settings for SW1 are:- close, open, close, open, close, open, close, close. As I said before the only reason the chip is on the board at all is to obtain two input bits for status bits of the above DLP USB chip (PC7 & PC6). I use bits 6 and 7 of the 8255 port C for this purpose. Ports A & B are brought to the top of the board as general I/O parallel ports. The remaining bits of port C are used as status/strobe/LED indicator bits for ports A & B. You should be able to test ports A and B yourself once the chip is configured properly. See the code in MyIO.Z80. A typical use of these ports would be a printer connection for your system. Finally we will add the USB interface "chip". This chip uses two ports, in my case I use ACH and ADH with U21 and SW4. (Note, U21 actually blocks out 4 ports, ACH to AFH) we only use the lower two). The switch settings for SW4 are:- close, open, close, open, close, open, open, close. Remember this chip is inserted on the board upside down so the USB connection faces upwards. Take care not to put it in backwards. Also the pins on this "chip" are somewhat large. They will not fit into some IC sockets. Check beforehand. Also in order to keep a low profile for the board I cut off about 1/8" from each pin. The chip should sit flush with the boards IC socket. If it protrudes to much it will prevent you placing another board in the S-100 Bus next to it. Working with this USB converter "chip" could not be easier. Simply connect a USB cable mini-B connection to it. You can for example receive data from a PC utilizing a modification of PCGET.ASM which I call USBGET.ASM on your CPM machine and a PC program like Absolute Telnet on your PC. The PC (Windows 7) automatically installs a window driver to talk to the chip. No Baud rates, no handshaking lines etc. It really nice for large file transfers. you should see 33H. Bit 7 of the 8255 port AAH will hold the status bit. Likewise if you send 33H from your Z80 port ACH you should see "3" on your PC telnet terminal. The Code for USBGET.ASM can be seen here. The file can be downloaded here. All components can be commonly obtained. I obtained mine from Jameco. For the 4.9152MHz Oscillator Jameco does not seem to have them any longer, but DigiKey has many e.g. #X108-ND, as do many others. Note, this is not a complete list. The demand for this board has been large. A new V2 version of the above board has now been completed. It's essentially the same as the first board (correcting the U2 address error mentioned above). See below for the most recent schematic. One minor change is the 3 indicator LED's now better reflect when the board is being used. LED D3 = whenever the USB data port is being accessed (read/write). Some other minor points. The schematic and board has a 0.33uF capacitor on the input to the Voltage regulator. This should be at least a 25V capacitor. On older S-100 systems that use linear (transformer) power supplies with quite some 8V ripple this value should be more like 33uF. To be on the safe side I always use 47uf/25V caps on the 8V input to all my boards V regulators. Also the onboard 4.92162 MHz Oscillator (P56), should be labeled 4.9152 MHz in the schematic. As I said above the speech synthesis chip/board is expensive. I never like to solder expensive chips like this to a board. However on this V2 board the board holes for this "chip" are just right that you can press the unit directly into the 24 holes. The fit is so tight you don't need to solder them. This way the board does not rub against the next board in your S-100 system. The USB unit's pins are a little narrower and really need to be soldered in place (or use a socket). Finally you don't need U18 and U23 (the RS232 converters) if you are using the speech synthesizer with the second SCC serial port. Here is a picture of the switch settings for the "standard" software ports used in the software below. Jumpers K1 1-2, K24 2-3, K5 2-3. Please note many older S100 bus CPU boards do not set the S-100 bus upper 8 bits to zero for I/O port addressing. In this case jumper K5 2-3, otherwise the CPU will not "see" the ports. (All S100Computers boards use the upper 8 address lines for I/O port decoding). Neil Breeden has provided the following Serial port summary picture. See here. The demand for this board has been quite large. A third version of this board was laid out. This version is called V3.1. The first batch was made by PCBCart in Jan 2016. It is identical to the above V2 board except that a more detailed Silkscreen was drawn up. This one has labels over all the IC's, and better legends over the switches and connectors. The KiCAD and related files are presented below. Wayne Warthen, pointed out that the default EEPROM mode for the newer USB1232H "chip" is set for a mode other than FIFO. This requires the board to be re-programmed using FTDIs tool T_Prog utility (http://www.ftdichip.com/Support/Utilities.htm#FT_Prog) to make the FIFO mode work as described above. The older USB245R "chip" does not require this modification and works as described above. 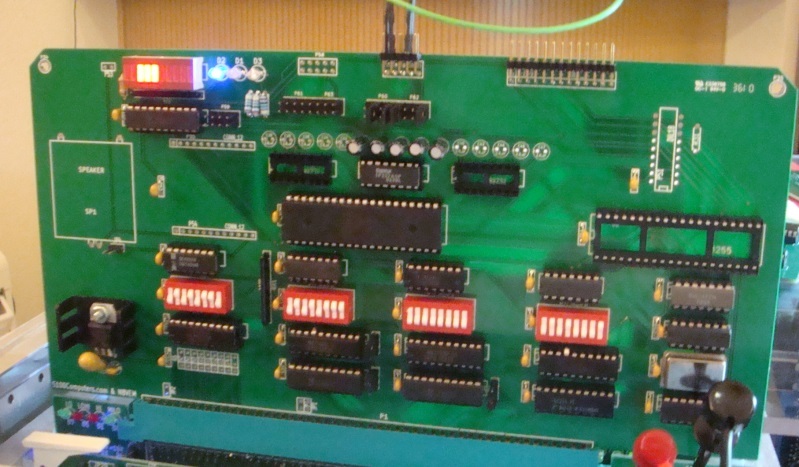 The links below will contain the most recent software and schematics of this board.